Sherlock Holmes is one of the greatest detectives in the literary canon, and he’s about to face off against one of the universe’s greatest terrors in A Study In Emerald, a new graphic novel adaptation of Neil Gaiman’s short story pitting Holmes and his trusty partner, John Watson, against H.P. Lovecraft’s Cthulhu. Dark Horse Comics has become the home for comic-book adaptations of Gaiman’s work, from American Gods to a wide variety of short stories (including How To Talk To Girls At Parties, recently adapted for the screen), and the publisher has hired exceptional artists to bring these tales to the page. 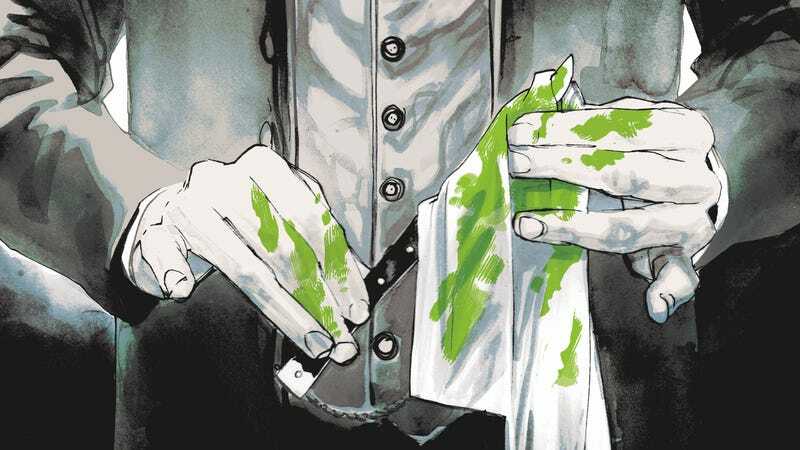 Co-written by Rafael Scavone and Rafael Albuquerque with art by Albuquerque and colorist Dave Stewart, A Study In Emerald is a beautiful, chilling journey through Victorian London, taking full advantage of Albuquerque’s skills for period horror. This exclusive preview of A Study In Emerald begins by highlighting how well Albuquerque and Stewart capture this setting, opening with two foggy, ominous shots of a carriage moving through the London streets. Albuquerque’s work on American Vampire strengthened his muscles when it came to period architecture and costuming, and that specificity is on full display in this excerpt. From the chemical lab of St. Bartholomew’s Hospital to the caves of Afghanistan to Holmes and Watson’s home on Baker Street, Albuquerque fills each space with evocative detail. This realism contrasts with the more fantastic imagery of Watson discovering Cthulhu as a soldier in Afghanistan, and Stewart uses a palette of blues and greens that make this flashback stand out amongst the grays and brown of London. Reader can learn more about this literary crossover when A Study In Emerald goes on sale June 27, but in the meanwhile, here’s an extended excerpt of the first 10 pages.